Ever wanted to be able to turn your fog lights on independently of your headlights? After owning a B7 for over 6 years and getting countless questions about this, I’ve finally gotten around to doing this “5 minute” mod and it’s pretty slick, actually. The modification is written up pretty well in the following link: Audizine DIY, so I’ll just expand upon some pointers and tips to make it easier, but essentially you just pop out the headlight switch and then use some copper wire to connect two of the prongs, then cover the old prong with electric tape. Lastly, update VAG-COM to rest of the world and you’re good to go! While I still strongly recommend an authentic Ross-Tech VAG-COM cable and VCDS software, this can be done with a knock-off cable according to other commenters on Audizine. For specifics on how to program this via VAG-COM, check out this link where it says “Independent Fogs.” Your coding should be either 01011 for halogen headlights or 01021 for xenons with DRL. Wrapping the two prongs together is a little more difficult than you’d think, and whoever did the write-up has excellent craftmanship – mine is much uglier looking, but functional all the same. Use a flat head screwdriver to help guide and wrap the wire around the two prongs, as well as hold the electric tape in place. 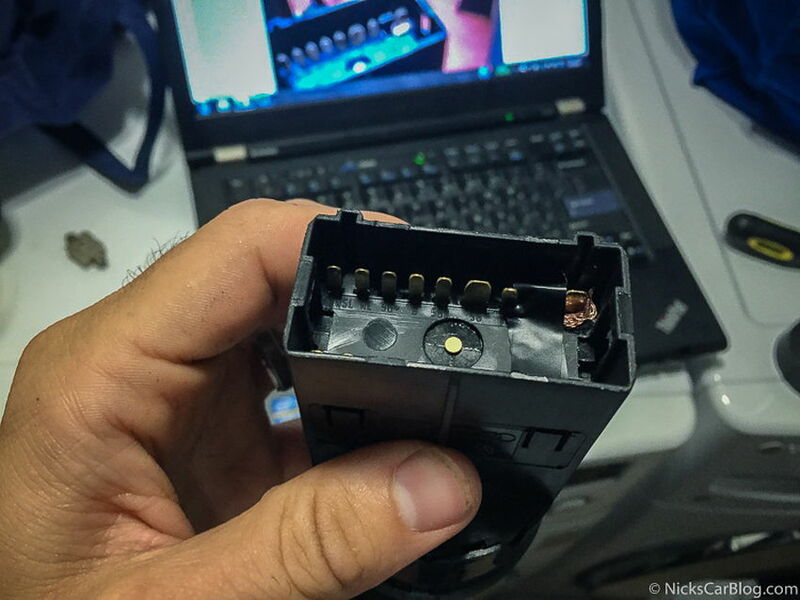 This mod will allow you to turn the fogs on when the headlight switch is in parking light mode by pulling the switch outward. Your Parking/City Lights will still be on, so it’s a good idea to put LEDs in there so it looks nicer as my DIY demonstrates. All in all, it took me about 20 minutes, but mostly because I was taking my time. After testing it in my garage, it’s a nice mod and I like that I can choose when I want my fogs on or off, originally I thought this mod would turn the fogs on whenever the parking/city lights were on and that would be annoying. This is a great mod, and I’m not sure why Audi wouldn’t offer this from the factory – but thanks to PSYC0TIC ONE on Audizine for writing up a way to do this ourselves! I think this option is only suitable for US cars… we in europe can already use fog lights independent of the headlights. Will the fog lights stay on with the high beams? Only if you want them to, just pull out the headlight knob like normal. No way to do this that I’m aware of, wasn’t able to find anything by searching on Audizine either. I don’t know Grover, I have an authentic ROSS-Tech cable. I’m assuming any of the knock-offs on eBay are likely to work, but if you plan on keeping your car a long time I’d recommend getting an authentic cable for finding a friend or shop that has one that you can use. Hey just wondering what you were using for fog light bulbs? 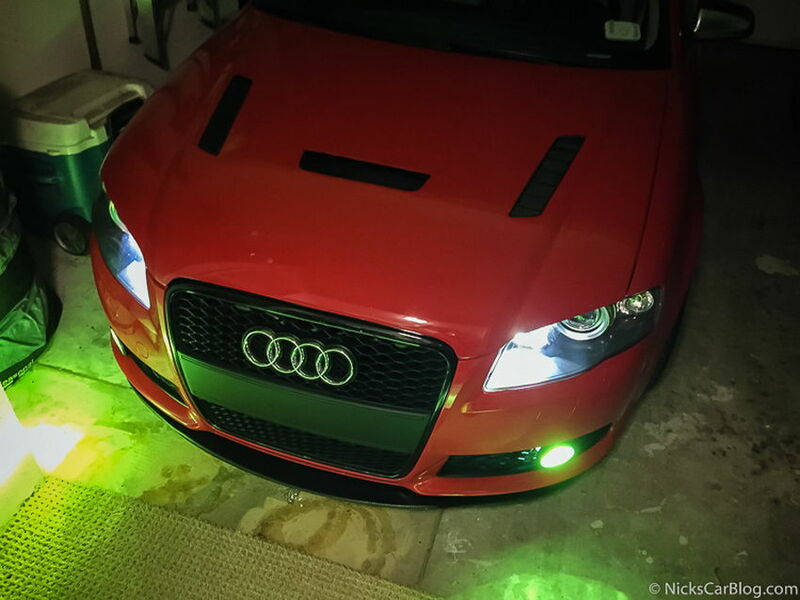 Hi Brandon – I bought these HID fog lights: https://nickscarblog.com/cars/hid-fog-lights-on-a-b7-audi-a4-and-s4 and then have yellow lamin-x over them. I’m new to the Audi world , always been a fan though , got the girl an 07 a4 and I’m learning along the way , I’m wanting to do the fog mod but what’s the vag-com deal ? What happens if I do the mod without it ? I’m not sure it will work without the coding, it basically changes the car to work as if it is in Europe where they have independent fogs rather than US where that isn’t an option. The Vag-Com cable is just an OBDII cable that lets you interface with the car’s software and reprogram things to unlock features/options in other countries or models. Definitely Justin. Is your A4 an S-line or regular A4? If S-line you can get the same exact ones, if just an A4 there is a replica RS4-style grille you can get that is much cheaper then do the same thing for the lower grilles. Did you get pre cut circles for the lamin-x on your fogs? Do you have a link. The honeycomb grille is way cheaper for the non-sline since they make replica ones, I think they’re about $100 last I checked and look really good. The Cupra Lip looks great on a non-sline, Votex also makes a lip / bumper extensions that looks pretty good as well! I have the Kerscher front lip: https://nickscarblog.com/reviews/kerscher-front-lip – also check out the Deval front lip. What version of Vag-Com did you have to use? I use a genuine Ross-Tech Vag-Com cable (USB) with the latest software they provide. Sounds like either a bulb or ballast is going bad, or you have a loose connection. Try switching the bulbs and seeing if the problem switches sides – if so, time to replace the bulbs. Just to clarify, when the my HID’s come on when set to auto, is there a way of also having the fogs come on as well? or does this mod only work with the city lights? Unfortunately, I’m not aware of any way to do that (fog lights come on with Auto), Zac. Hey nick. Ever since I did the coding for this mod, my DRLs no longer turn on. I don’t have the led ones either, its the regular type of bulbs. I’ve tried all combination of light settings from inside the car but no matter the conditions they just stay off. Any help would be very appreciated. Thank you. Thanks nick. I have the OEM xenon headlights like you have. I will check the codes when I get back home. Hey Nick, great site. I actually just ran into your site today. 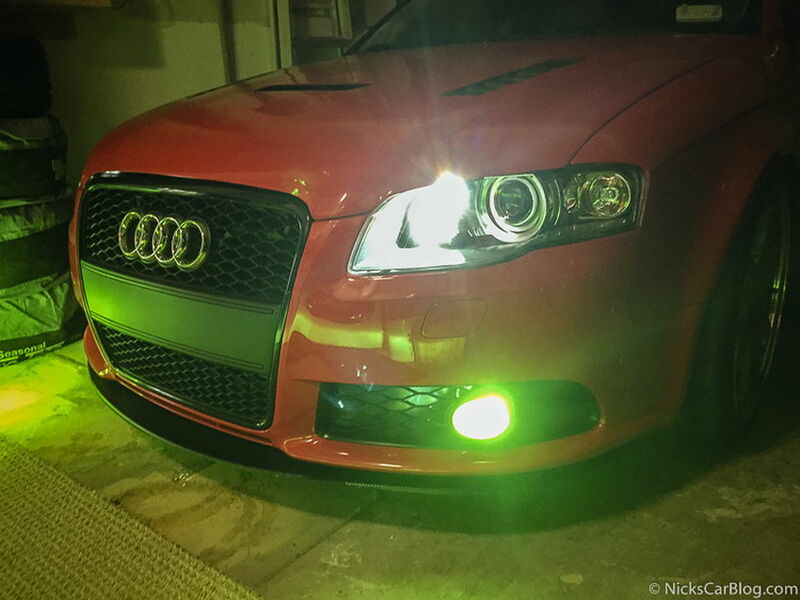 Need help… so I installed an LED set for the Fogs and my high beams didn’t work. I took the LED’s off to diagnose the problem and the High beams worked just fine. I also ran into this problem when I installed HID’s for the regular Low beams, I took those off and went back to stock and the High beams worked just fine. Please help… how can I keep my High Beams working? Hey Matthew – that is really weird. I haven’t done LEDs on this car but my guess is that something to do with the wattage or voltage being too different, so the system thinks there is an error and isn’t powering it. I’d maybe try doing an HID kit instead. Do you get a bulb out error on the dash?